My Uncle Wink had one of the original Camaros and that’s the car I learned on to drive a stick shift. Talk about spinning your tires and kicking up gravel! But in 1970 Chevrolet launched its second generation Camaro and its looks, with those single headlights that blended into the front fenders and the split front bumper, along with its fastback styling, wowed us teens. At the same time Chevy was introducing the Vega, Camaro’s little brother, reflecting similar sporty lines. So I’m always happy to see the 1970 pony car, as Camaro was known then, in any model or format. 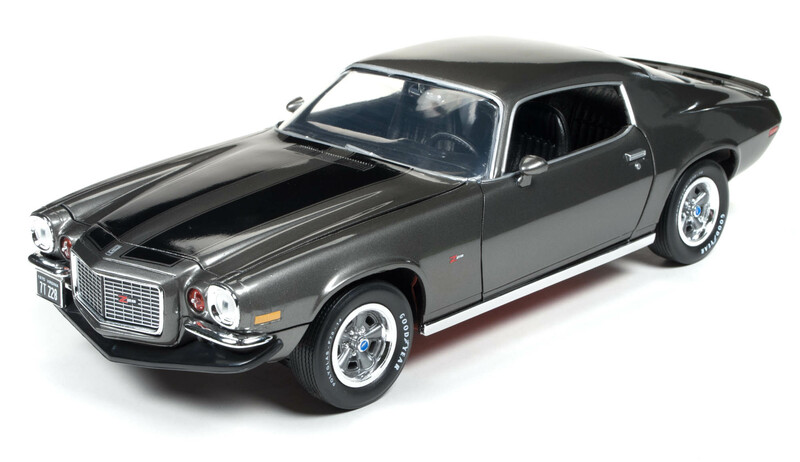 Thanks to Auto World, the Z28 version in its Galaxy Gray (dark metallic silver) paint scheme with black racing stripes slashing across the hood and trunk is ready to kick your die-cast collection up a few notches. Best yet, Auto World’s 1:18 American Muscle series delivers at a reasonable price, just $84.99 in this case. Heck, a lot of 1:43 models cost that now. Auto World delivers nice under hood detail for the price. The second-gen Camaro debuted in February of 1970 after Chevy let the first-gen car’s production run through the end of 1969. That resulted in a record 243,000 Camaros being made in 1969, while this new model with the shorter run ended up at 125,000 cars produced in its first year. The gen-two Camaro was so popular that the body style lasted until 1981. In any case, Camaro was hotter than Farah Faucet at the beach on a summer afternoon and offered a crazy amount of engine choices and trim levels, such as Rally Sport and Super Sport. The review car is the top-level Z28, which came with a Turbo-Fire 350 (cu.in.) 5.7-liter V8 and a big Holley carb on a high-rise aluminum manifold. The 360-horse engine was known as the LT-1 and came directly from Chevy’s powerhouse, the Corvette. Hard as it is to believe now, the package cost just $572.95. In addition to the engine upgrade, the Z28 package included special wheels, stripes, and spoilers, along with a performance-tuned chassis that include higher rate springs and shocks, a rear stabilizer bar and quick-ratio steering. First, Auto World gets a major attaboy for keeping the price down while still turning out handsome 1:18 muscle cars. They have quite the selection now. This Z28 is extremely sharp in silver and black and also features proper Z28 decals on the front quarter panels, lip of the rear spoiler and grille. Front and back there’s also a custom 1970 Virginia license plate, cleverly imprinted with 7T Z28, get it? Even the seat backs fold forward and there’s a cue-ball shifter. Head and taillights look realistic and the chrome bumpers, grille and rocker panels look good, as does that tiny rear spoiler and the black nose spoiler. Most things open here too, key being the doors and hood, while the rubber underneath is well-labeled Goodyear Polyglas tires that ride on five-spoke wheels that are chrome and body-colored. The Camaro’s wheels turn with the steering wheel too. Auto World delivers a detailed engine bay with orange engine block, chrome 350 Turbo Fire-labeled high-rise manifold, wiring and hoses plus radiator and fan assembly along with power steering unit. Door and hood seams are reflective of the early 1970s, and this price point, while the door handles and window trim are painted silver, not chrome. But in a case or on a shelf, the Z28 looks as racy as you’d ever want, or expect at less than $100. The 1970 Camaro Z28 looks good in profile, even now! Inside, the interior is well executed with black pleated seats, the front buckets with backs that fold forward, and a great looking dash, fake wood trim and all. Gauge faces are visible and the console features a chrome shifter with cue-ball knob. 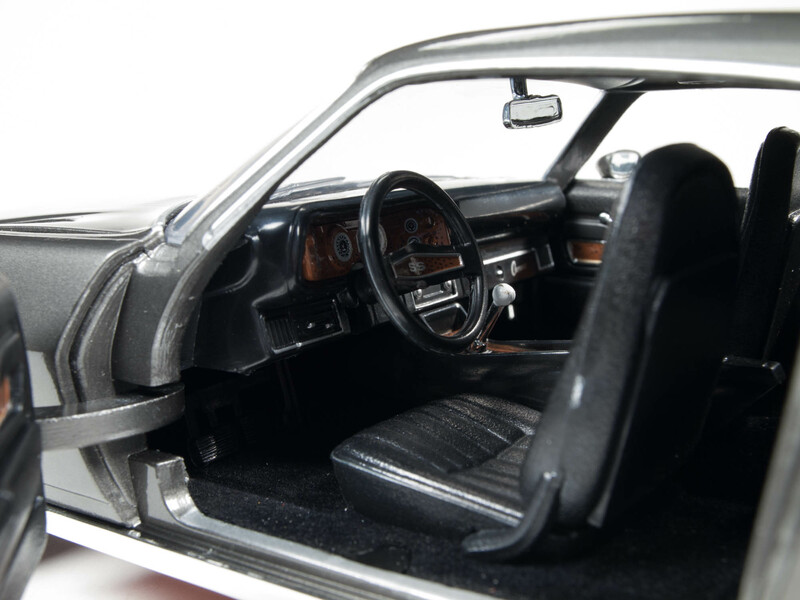 This is an extremely sharp model for display and beautifully represents the best of early 1970s muscle cars. Note too it’s part of a limited run of 1,254 models.